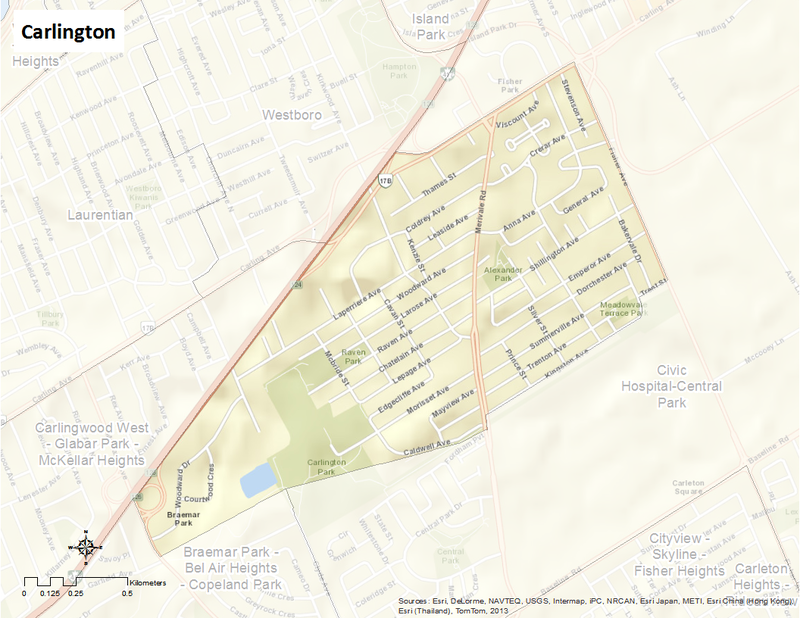 Carlington is bounded by Carling Avenue to the north, Kingston Avenue and Caldwell Avenue to the south, Fisher Avenue to the east, and Maitland to the west. This neighborhood contains a small number of older homes that were built after WWII to accommodate returning veterans. These homes were known as “war homes” or “veteran homes”. Many of the street names (e.g., Admiral, Veteran, Marshall) reflect the military heritage of the neighbourhood. The neighbourhood includes the communities of Carlington, Bellevue Manor, Caldwell, Lepage Manor and Mooretown. Here’s an infographic that describes Carlington as a Village of 100 (2011 data).